Located in Lafayette, Louisiana, Scofield & Rivera was formed to exceed the expectations of its clients by providing prompt, personal attention; effective communication; hard work, and quality, innovative legal services — virtues that larger firms often forget. These goals have allowed us to consistently earn successful results for our clients, either through professional representation in the courtroom or favorable settlements. Scofield & Rivera, LLC has an "AV" rating - the highest awarded by Martindale-Hubbell. 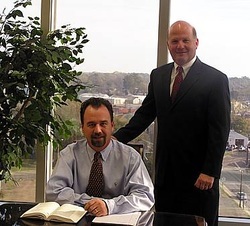 Bryan and Jim have practiced together since 1995, and both bring outstanding academic and professional credentials to the firm. Bryan and Jim each served on the Louisiana Law Review, and Jim earned Order of the Coif honors. Both have been repeatedly named as "Louisiana Super Lawyers," and each has been recognized as "TOP attorneys" in Acadiana by their peers. Further, Jim is a certified mediator. Each has successfully represented the interests of their clients in many types of litigation in state and federal courts throughout Louisiana. Both have individually achieved Martindale-Hubbell "AV" ratings from their peers. The firm focuses on civil litigation ranging from multi-million dollar catastrophic oil and gas well blow-outs to commercial automobile accidents. Bryan and Jim regularly handle a variety of claims, including oil and gas, maritime/admiralty, commercial trucking and auto, insurance defense, products liability, residential and commercial construction defect, premises liability, environmental clean up and contractual indemnification/additional insured claims. Representative clients include oil and gas operators, service companies, vessel owners and operators, commercial trucking and service companies with automobile fleets, commercial and residential builders/general contractors, other business interests and insurance companies in the United States and London markets. Copyright © 2014 Scofield & Rivera, LLC. All Rights Reserved.